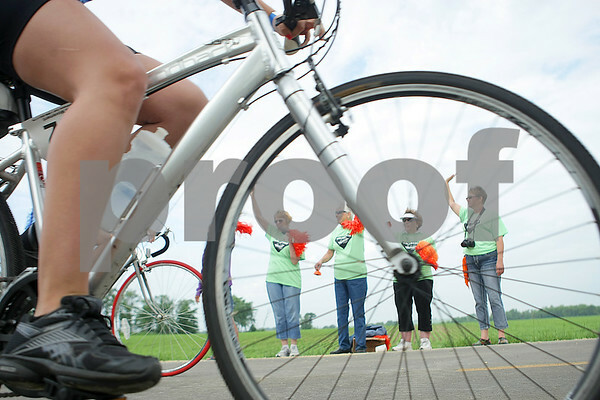 Rest stop volunteers, from right, Dawn Gibson, Caye Pierce, Phyllis Roush, and June Ehrler, cheer on bikers on Malta Rd. in Kirkland on Saturday, June 21, 2014, during the Bike MS Tour de Farms. Gibson lost her mother-in-law, Ione Gibson, to multiple sclerosis on Sept. 1, 2012. Pierce is Ione's sister and traveled from Wisconsin to cheer on riders.